Omprakash Pramila Devi Memorial Charitable Trust on Saturday distributed scholarship to the needy HSLC students of 2018 at the auditorium of The Lankeshwari Natya Mandir in Lanka Under Hojai District. This year scholarship was given to 14 meritorious and needy students (belonging to extremely financial weak families). 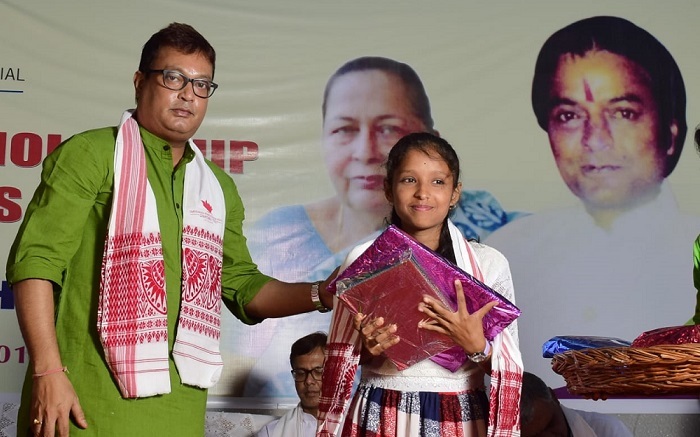 Scholarship in the form of books, note books, other study materials, 2 pair of school dress, and admission fees to college to a few and cycle to some as per the assessment of individual needs were distributed. Jiten Bora, superstar of the Assamese film Industry, graced the occasion as the Chief Guest, Shiladitya Dev, Legislator Of Hojai Consistuency, Manvendra Pratap Singh, IAS, Deputy Commissioner, Hojai District and NK Vasu, IFS, Principal Chief Conservator of Forests attended the function as Guest of Honour. All the distinguished guests highly appreciated the efforts of the trust and motivated the students. In the event, Phani Bhusan Chakraborty, winner of one gold medal and one silver medal at the 6th Sr. Master Men & Women International Strengthlifting Championship 2018, held at Bali, Indonesia, was felicitated with an assamese gamosa and memento. The parents of Akash Thapa, who secured first Position in Assam in Assam Higher Secondary Education Council Examination (Science Stream) 2018, and Akshat Chhawcharia, who secured 10th Position in AHSEC Examination (Commerce) were felicitated in the programme. Both students are from Hojai district. Jabin Kawsar, who is physically challenged, wrote her HSLC exam with her toes and secured first Division. She belongs to a very poor family. She was also felicitated on the occassion and given a financial assistance. The Omprakash Agarwalla Memorial Excellence Award was given to Bhaswat Pritam Sarma of Hojai for securing highest marks in HSLC exams (amongst the boys)this year in Hojai district, while the Pramila Devi Memorial Excellence Award was won by Nayeema Firdous Borbhuyan of Nilbagan for securing highest marks amongst the girls. In fact, Nayeema secured the 10th Position in Assam this year in HSLC Examination. Three students of 2016 batch of this scholarship programme namely Himakshi Bhuyan, Priya Paul and Nazmin Faruki were also felicitated for performing well in this year’s HS exams. Also the trust has decided to extend the scholarship of Himakshi Bhuyan up to Graduation. Also, the scholarship of 11 students of last year 2017 were also renewed for next one year. “I am thankful to the Principals of the leading High Schools as well as the Colleges of the Lanka town, and teachers and Professors, local leaders of almost all the political parties, students organizations of the area and media persons of the district both print and electronic for their august presence on the occasion which has highly inspired us.”He added. On this occasion, Advisors of the Trust Subash Basudeva, Hari Shankar Tibrewalla and Toseswar Tamuli Phookan were also present. The event was anchored by Trust Advisor Advocate Bharat Tamuliphukan.